Suji Ka Pua, an authentic dish of Kumaon (Uttarakhand).If you have a sweet tooth then you will surely like these sweet suji puas. These sweet Puas are prepared during on every auspicious occasion in Puja as Naivedya in Uttarakhand. Mix all the ingredients semolina, sugar, yoghurt, and cardamom powder in the bowl. Cover it and keep aside for half an hour to ferment. 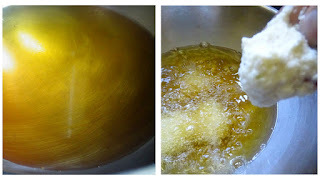 Heat The oil or ghee and take little amounts of a mixture at a time and put it in hot oil. Fry on a medium flame till they turn golden brown then take out. Drain onto an absorbent paper and serve. 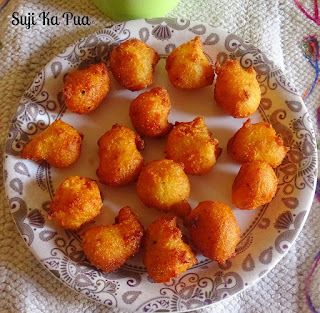 Serve hot or cold Sweet Suji Pua with tea. 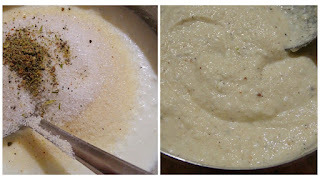 Mix all the ingredients semolina, sugar, yogurt ghee and cardamom powder in the bowl. On medium heat pour oil in a deep pan(Kadhai) and heat it sufficiently. Stir the batter well and take little amounts of a mixture at a time and put it in hot oil. In this manner take mixture in your hands again and put more proportion to the oil, in the pan. Fry all Puas in the same process. Drain onto an absorbent paper. Instead of yoghurt, you can use mashed ripe banana. You can use saunf in place of cardamom powder. Add some milk or yoghurt if required to adjust the consistency of a batter. The mixture for Pua has to be thick like the one used for Pakoda. 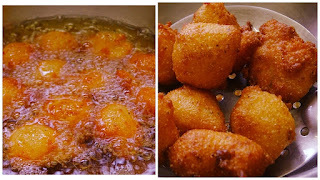 Nice..looks like punugulu,the andhra snack!! WOW! 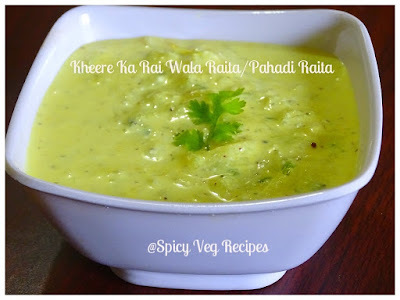 This sounds interesting and amazingly delicious Swati! New recipe﻿for me.. Lovely recipe and beautiful pics. This is a quick recipe when you have sudden guests!